A Full Set Of Models For Human Reproduction. 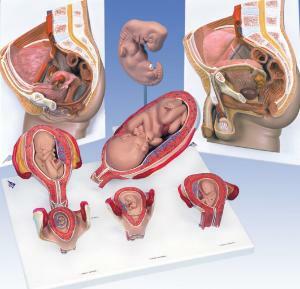 This collection of 4 models allows you to approach human reproduction in great detail. The Male and female pelvic models allow you to discuss reproductive organs and structures in detail. Each of these two relief models can be displayed flat, or hung using included hardware, and includes a key identifying over 60 structures on each. The standard series of pregnancy model is actually 5 models all mounted on the same base following the development of a fetus through 1,2,3,5, and 7 months of development. Finally the 4 week fetus model can be examined to learn about 22 individual structures.